According to some of the world’s top hairstylists, 2019 will be all about side bangs: so you should expect a lot of requests for this on-trend look as well as other popular variations. Most hairdressers will have their tried and tested methods when it comes to approaching bangs, but working with efficient, purpose-built shears will significantly improve your comfort and give you more creative, à la mode results. For the past thirty years, Sensei has worked closely with industry professionals to craft the kind of shears and razors that will give you the flexibility and freedom to work quickly, accurately and intuitively, so let’s look at how our range can help you to create marvellous bangs. This is a straight-across style that’s usually thick and heavy. We wouldn’t recommend this type of fringe for someone with a thin hair density or rounded face shape. 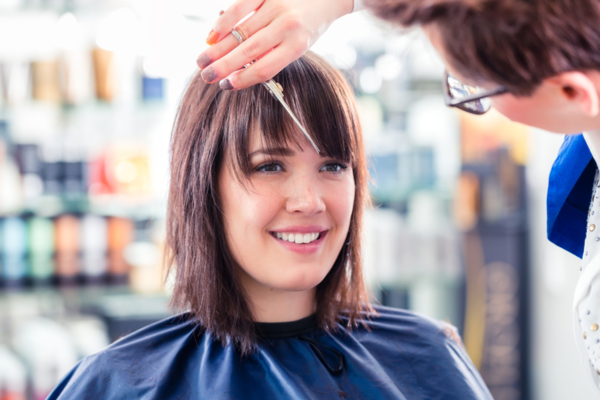 Tip: Blunt bangs need to be cut dry so that you can keep a real perspective on the final result. Find the natural parting and use a tail comb to create a triangular section from the crown of the head to the temples, you then want to cut straight across under the comb without elevating too high – we’re not trying to create layers here. We recommend using the Sensei Dry Evolution shear which is designed especially for use on dry hair. Made from Japanese Cobalt/Molybdenum alloy steel with Sensei Cryo™, this blade is precise, durable and built to last. Finally, use thinning scissors if you’d like to tone down the weight of the bangs. The SENSEI seamless blending shears are perfect for this job as they give you complete control, they leave no lines and make it nearly impossible to cut too much – a common mistake which could really ruin the blunt bang look. Using a razor isn’t something every hairdresser is comfortable with, but it’s one of the best ways to build soft layers or to create a chunkier more daring look. You could take zigzag sections and make your way across in a circular motion then repeat in the other direction. For a softer edge, use a backstroke – this gives your bangs a graduated texture, making them easy to side sweep or gently frame the face. You must focus on the angles in order to get a lot of movement through the hair: keeping good control of the razor, cut long to short, long to short. The nylon bearing rotating finger ring on the Sensei razor allows you to do just that with great ease. The super smooth polymer coated blade on the Styling Razor Deluxe lets you glide through the hair, making sure it’s left undamaged and without split ends. Tip: A new fringe can take a lot of getting used to for some clients, using a razor will help to create a more natural, flowing style that’s easy to shape. The razor will also supply you with the versatility to try out edgier, bolder styles. Warning! This look is not for everyone. If your client has a complementary face shape and enough hair to rock this style, you’ll still have to tread carefully. This statement look can be created with a point cut in an upward direction. The 5.75” Evo Series 2 are a fantastic tool to use when crafting a super short fringe. The polymer inlay in the full pivot area eliminates metal to metal wear and the leaf spring ball bearing tension system helps to stabilize the blades, extending the edge life. There are several techniques you could use to create variations of this look. Chunky bangs require deep point cutting, lots of layering and elevation to get the right texture. You’ll have to divide the hair into sections and then start cutting in a side sweep motion from left to right. Change direction with each section. The thicker the hair, the more layers you’ll be able to create. It’s recommended that you use a blending shear for a softer texture. The Sensei Primo blending shear has a Soft Slide™ straight blade design that gets rid of any drag or pull as you comb through the hair after the cut. Make sure you divide the hair from a high point at the top of the head and then make a diagonal parting to get your first section. Find the bend in the hair – that’s usually the place where you will start cutting with your thinning scissors using a backstroke technique. Tip: You’ll want to avoid building up too much weight at the top; remember, the more you elevate the hair, the softer and lighter it will look at the front. Bangs are an exciting way to switch up a client’s look, but you should always proceed with caution. The style of fringe you choose to cut will depend on the face shape and hair density of the person, so you’ll need to have a candid conversation about what will work and what won’t. Cutting bangs is all about precision, a good understanding of face structure and, of course, excellent craftsmanship. Upgrading your toolkit could really transform your styling game, so take a look at what our range has to offer and get ready to help your clients kick off the new year with a bang. Previous Previous post: What Makes A Good Barber Shear?